See Large gingery/tawny animal seen on Black Isle information on the animal which probably made these tracks. I recently had a brief glimpse of what appeared to be a big cat, crossing the road in my headlights. Next day I returned to the spot and found tracks, which I photographed. I have tried to identify them from a book, but I am a complete novice and I really would like to have confirmation - or to be put on the right track - by someone with experience. Can you suggest anyone who might be prepared to attempt an identification from photographs? This image of puma prints may help you with size, shape and stride. Thanks Chris: Here are four jpg's of the tracks: two close-ups of prints, two to show the gait. They all lay along one line, clearly the same animal. The tracks were close to the road where I sighted the animal the night before. There is a (mostly pine) forest four hundred yards away. On the other side of the road, where the tracks appear to be heading, there are fields, patches of woodland and then a large forest about half a mile away. The coin in the photos is a ten pence piece, the red markings are spaced at one-inch apart. I hope this is enough information for a positive identification. The pictures were taken with a cheap digital camera, so this is as much detail as we can get. I would have to say, based on my limited ability in identifying tracks, these are most probably dog. Claw marks are sometime seen in feline tracks but whenevever they are, the pads will be plainly separated. In the case with these tracks, the pads are closer together. The pads also seem somewhat tapered as opposed to rounded shape of feline pads. 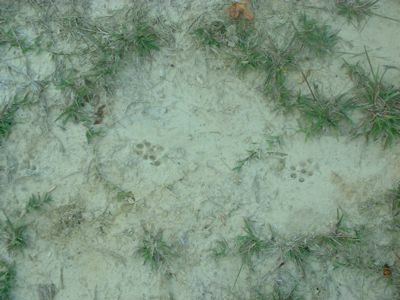 The images above might be helpful to anyone intersted in indentifying feline tracks. I photographed these tracks and some others at a small pond near my home. These particular ones are bobcat, but they are typical of the cougar and all lynx species when stalking prey. In order to maintain quietness and stealth, the cat steps in the same spot from front to rear. Whenever these type double-tracks are seen, they are almost assuredly those of a feline. 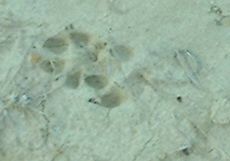 On a soft substrate such as sand or mud occasionally the claws are often seen within the tracks. As the mud pushes upward between the pads, the claws are extended much the same as when we hold and press against our domestic cat's paws. Thanks, Chris, for getting back to me. I'll have a look at the URL immediately. Personally, I am convinced that the tracks are not a dog, but as I said, I don't know a lot about tracks. However, I do a bit of graphic work, as does my friend Steve, and we scanned in tracks from a book and tried to match them against the photos. No native animal matched, and the dog definitely didn't. 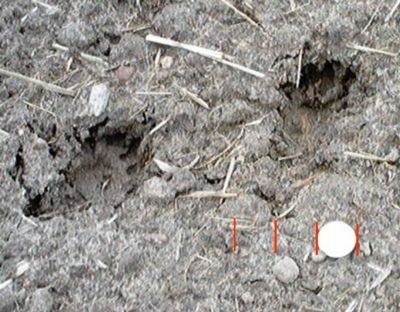 However, the lynx tracks matched to perfection: the gait, the pawprints, and most tellingly, the markings in the centre of each pawmark. You probably all have other things to occupy you, but I would be happy to send the comparison shots if anyone feels there is any point in seeing them. 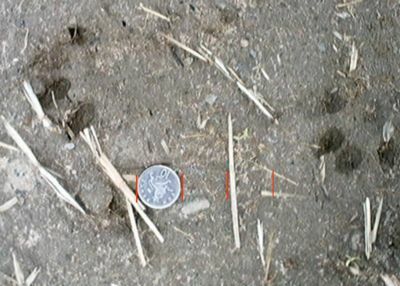 I have looked at the website, and, not having seen the photos for a few weeks, I did notice the pointed look to some of the pad marks, which does tend to suggest a dog. Of course, I recognise that I would be delighted to be fully convinced that there is a lynx in the neighbourhood - whereas I'd be disappointed to find out that it was just a dog. Nevertheless, taking this bias into account, I remain sure (about 85% !) that what I saw was a lynx.